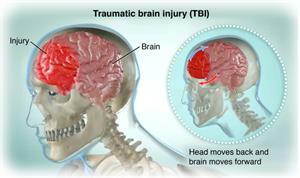 A traumatic brain injury (TBI) is a type of brain injury caused by a blow or jolt to, or penetration of the head. A TBI can occur during a car accident, from being tackled during a football game, or from a combat-related wound. After a TBI, nerve cells in the brain may be damaged. The neurons may have trouble doing their job of carrying signals to different parts of the brain. If you have a brain injury, you could have trouble thinking or moving normally. Your brain may also have trouble keeping your body working properly. Most cases of brain injury that occur each year are mild. A concussion is a minor form of brain injury. But, many TBIs can be severe. Severe brain injuries require emergency care. People with severe injuries may require a lengthy recovery period, and their symptoms can linger for a long time. A TBI may occur after your head strikes an object, or when an object goes through your skull and damages your brain. Many TBIs occur during motor vehicle accidents. Falls, firearms, explosions, and assaults are other major causes. How is traumatic brain injury diagnosed? Your healthcare provider will ask you questions about how the injury occurred and if you are having any symptoms. He or she will also likely want to know if you were unconscious after your injury and will ask you questions to evaluate your thought process. Your healthcare provider may want to do X-rays or a CT or MRI scan of your head and neck to assess the extent of the injury. How is traumatic brain injury treated? A mild brain injury may not require medical attention. More severe cases require medical care. If your injury is severe, you may need surgery to treat bleeding or bruising. After treatment, you may also need rehabilitation. During rehab, therapists may help you regain abilities and skills that were lost due to the injury. For example, you may need help learning to speak, move, and take care of yourself again. Social support is also an important part of rehab for you and your family. Can traumatic brain injury be prevented? Always wear a seat belt while in a vehicle. Make sure airbags are in working order in your car. Wear a helmet while on a bicycle, motorcycle, or horseback. Also wear a helmet during contact sports, such as football, and when riding skates or a skateboard, or while batting during baseball or softball. Take precautions to avoid falls around your home. If you have diabetes and have numbness in your feet, avoid walking in poorly lit areas. Buckle your child into the appropriate child safety seat every time the child rides in a car. Use safety gates and window guards to keep children safe from falling out of windows or down stairs. This type of injury may cause long-term changes. It may affect your thinking, your mood, or your ability to think, see, or hear normally. If these changes are severe enough, you may need help with your daily activities. Protect your head. Take extra care not to do anything that could put you at risk for another head injury. Take it slow. Get plenty of rest and take time necessary for your brain to heal. The brain is slow to recover. Also, avoid driving a car or riding a bike until your doctor approves. You may have a delayed reaction time after suffering brain injury. Use memory aids. Use notes, a white board, alarm clocks, calendars and your mobile phone to help you remember important events or activities. Search the web for helpful memory apps you can download to your phone or computer. Evaluate and adapt job or school tasks. Depending on your disability, your employer or school may be able to make some accommodations for you to continue work. Consider options with a flexible schedule or part time work, reduce distractions and clutter in your work area, make daily ‘To Do” lists. Take notes or ask to use a tape recorder to help you remember things. Ask for less stressful assignments that have a flexible deadline. Get support. Consider joining a local support group or find one online. Sharing your story and learning how others manage their condition can help. Traumatic brain injuries are caused by a blow or a jolt to the head. They can range from mild to severe. Symptoms can range from headache, dizziness, or trouble thinking to nausea, vomiting, seizures, or loss of consciousness. Severe injuries need treatment right away, which might include surgery. People with severe injuries may have a lengthy recovery period.